Hurricane Lane is bearing down on Hawaii, dumping up to a foot of rain on the Big Island and lashing the state with rough winds. The now Category 1 storm may bring over 30 inches of rain to some areas, making them vulnerable to flash floods and landslides. After the hurricane weakened, the winds slowed down from 125 mph to 85 mph. About 300,000 tourists are currently in the state, Hawaii Sen. Mazie Hirono said in a press conference Thursday afternoon. Public schools across the state are closed Thursday and Friday in anticipation of the storm, and several major airlines have issued weather waivers for Hawaiian airports in advance of any damage. 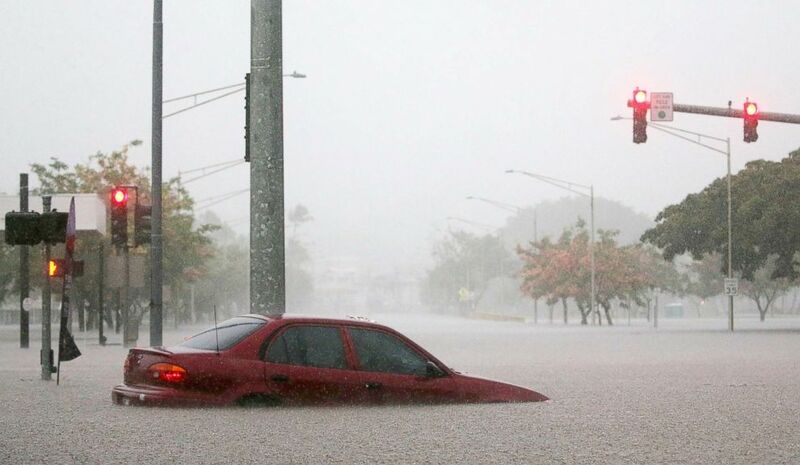 A car is stuck partially submerged in floodwaters from Hurricane Lane rainfall on the Big Island, Aug. 23, 2018, in Hilo, Hawaii. 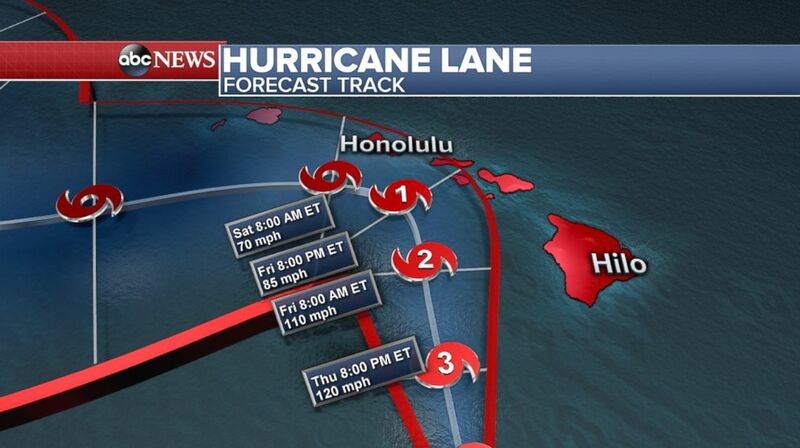 Hurricane Lane is forecast to pass very close to the islands Thursday, Friday and Saturday. Even if it does not make a direct landfall on the state, it's still expected to have a major impact. Lane will likely weaken to a Category 1 or 2 hurricane as it passes the islands on Friday and Saturday, because the closer it gets to the cooler waters surrounding the islands, the faster it will start weakening. As it passes south of Honolulu Friday night into Saturday, it is expected to further weaken into a tropical storm. Hurricane Lane forecast track as of 12 pm ET, Aug. 23, 2018. Heavy rain will likely be the storm's biggest impact; flash flood watches are in effect for all of the islands. Twenty inches of rain have already fallen on parts of the Big Island. 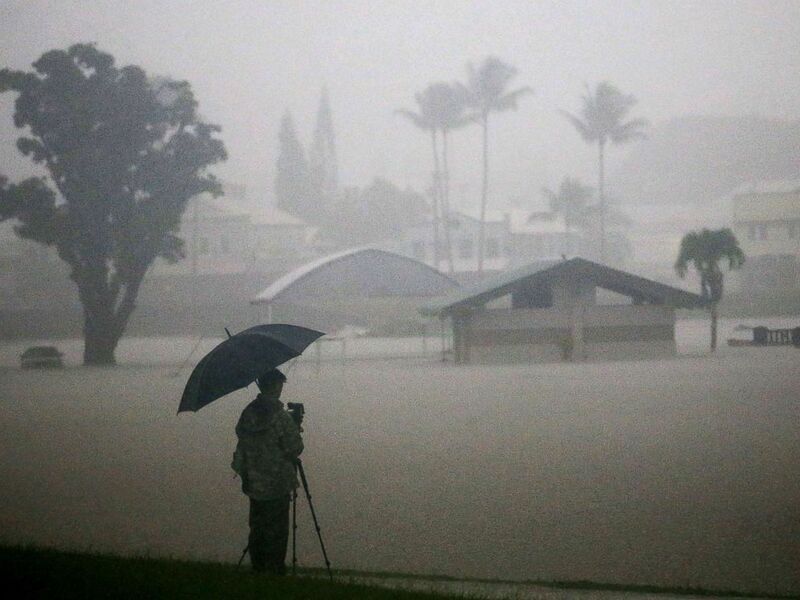 A man takes photos of floodwaters from Hurricane Lane rainfall on the Big Island, Aug. 23, 2018, in Hilo, Hawaii. Hurricane Lane has brought more than a foot of rain to some parts of the Big Island which is under a flash flood warning. The rainfall caused landslides on a highway on the Big Island, the National Weather Service said, citing county officials. Life-threatening surf is also expected across the islands over the next few days. The large waves and storm surge will push water levels 2 to 4 feet above normal tide levels, especially along the state's southern and western shores. 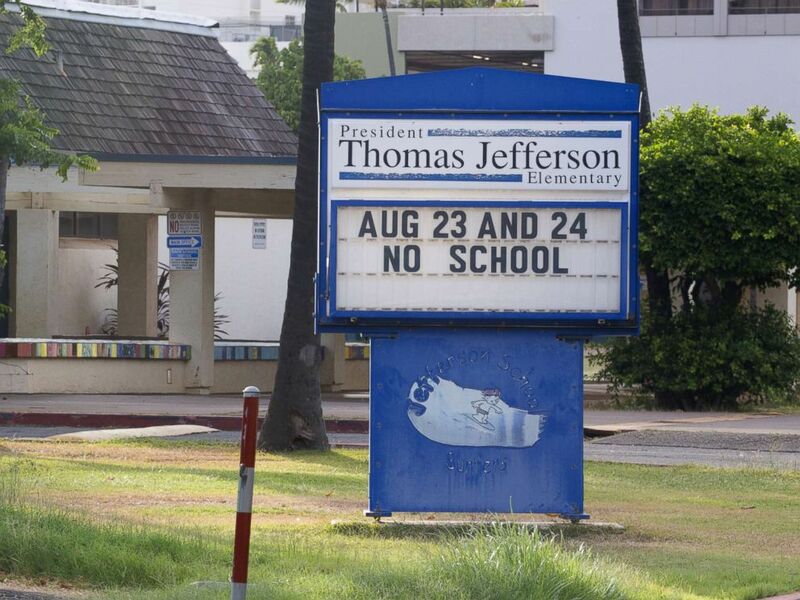 Thomas Jefferson Elementary School displays a sign reflecting Honolulu Mayor Kirk Caldwell's closure of all public schools on Aug. 23 and Aug. 24th due to the threat of Hurricane Lane on Aug. 22, 2018 in Honolulu. Maui County Mayor Alan Arakawa stressed the severity of the storm during a press conference Wednesday. "This is the most serious ... and I've been alive 63 years," Arakawa told reporters. "Undoubtedly, we're more prepared then we've ever been," he added. 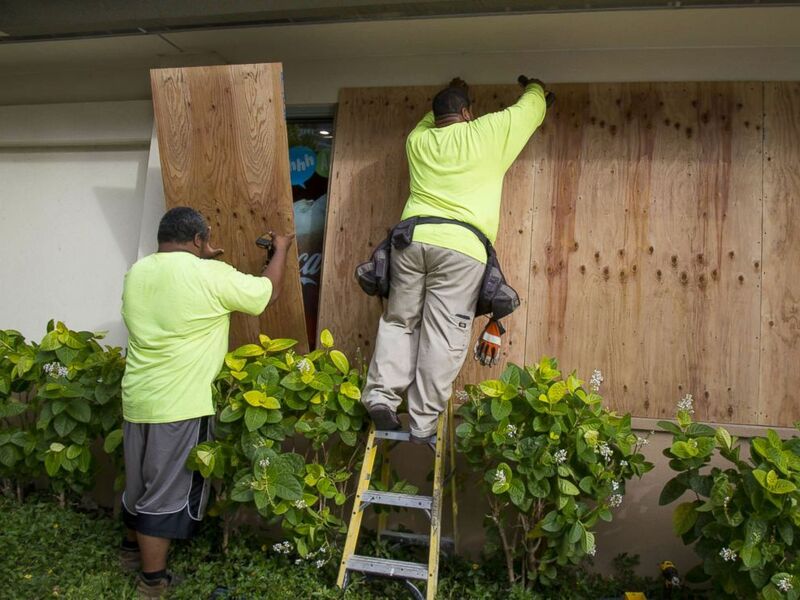 Yamasaki Construction workers, Talbot Khakai, left, and David Halafihi board up McDonalds multiple plate glass windows in preparation for Hurricane Lane on Aug. 22, 2018 in Honolulu. President Donald Trump said he authorized an emergency disaster declaration to provide support to Hawaii. "Our teams are closely coordinating with the state and local authorities," he tweeted Thursday. "You are in our thoughts!" Water, meals and generators are being delivered to the islands and evacuation centers were opened in all four counties, officials said. Over 300 people are already at evacuation centers and that number is expected to significantly increase over the coming days, said Brad Kieserman of the American Red Cross. Hawaiian residents and visitors flocked to stores to stock up on food, water and gas ahead of the storm. Some businesses and homes have already been boarded up. The Hawaiian islands are also surrounded by cool water and tropical cyclones need ocean water temperatures to exceed 80 degrees to strengthen. 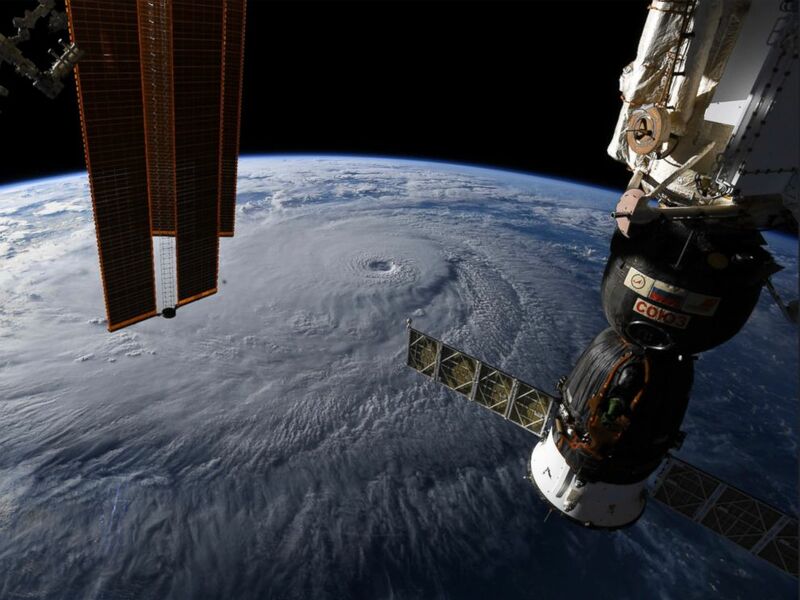 This image provided by NASA on Aug. 22, 2018 shows Hurricane Lane as seen from the International Space Station. Category 1 Hurricane Iwa also had a major impact on Kauai in 1982, but because its eye did not hit the island, it wasn't officially counted as making landfall there. ABC News' Gio Benitez, Max Golembo, Christine Theodorou and Crystal Muguerza contributed to this report.